I’m not talking here about the day-to-day outings when your baby/toddler/pre-schooler nods off the minute the car engine hums into life. Timed well (not too close to bedtime if you value your evenings) such travel-induced cat-naps provide a grateful interlude for everyone. ‘Travelling’, with a capital T, is an altogether different story. Nobody looks forward to it but, sometimes, it just can’t be avoided – especially in this day and age when families are more dispersed than ever. So if you’re about to set off for the other end of the country with the family in tow, you need to plan your trip with military precision if you wish your sanity to remain intact at your destination. I’ve endured a 24-hour flight to Australia with a 5-month old, which turned me into a passionate sling addict for its wondrous ability to morph a fretful baby into Sleeping Beauty anytime, anywhere. I’ve also undertaken a 9 hour car journey to Wales with a 2-year old and 6-month old, which left me with post-traumatic stress disorder and a promise to never travel further than our local Sainsbury’s. But having just survived a 6-hour drive and ferry journey with my 3 and 5-year old, I think I might have finally cracked it. Or maybe I just got lucky. Either way, here is my list of travel essentials to help you turn the journey from hell into Road Trip Adventure. And it doesn’t involve a single game of I-spy. 1. First of all, it’s crucial to schedule your journey around your kids. 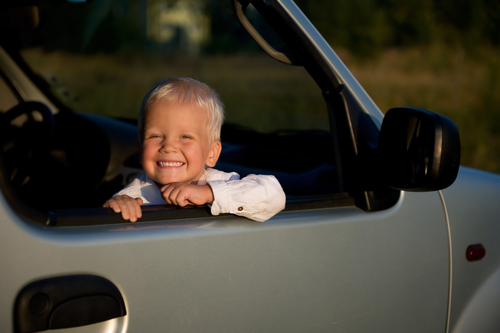 Most young children can be relied on to kip in the car at some stage so plan your longest stretch of driving for the time they’re most likely to nap. That’s less time for them to be bored and more time for you to take a break from Bob The Builder. 2. Likewise if you’re on a ferry or ‘plane, try and book departures for when your kids are normally ready for some down time. Reading books (or picture books for tiddlers). Perhaps a couple of old favourites plus 1 new book to surprise them with. A wipe-clean activity book (Priddy Books make good ones as do M&S ) or a Magic Slate. For older kids, try some of the travel-sized or magnetic versions of Scrabble, Connect 4 or backgammon. Notebook and/or colouring book for creative types and committed diarists. A word of warning though: I would strongly suggest only packing coloured pencils. Felt-tips inevitably end up on legs, arms, seats, windows and anything else within arms’ reach. Tapes, CDs, iPod…whatever sound system you possess, use it. Sure, Wheels on the Bus will drive you round (and round) the bend but as well as diverting your offspring from screaming with boredom, nursery rhymes are educational, increasing vocabulary and developing rhythm. Older children will enjoy story tapes or the radio if you’re lucky. Picnic breaks are a winner, giving everyone the chance to stretch legs, use facilities and devour food without littering the car with crumbs. En route, snacks keep the mood buoyant but remember, there’s a fine line between contented and out of control. I personally would avoid anything sweet…sugar + small child + limited space = all hell let loose. And chocolate just melts. Everywhere. So try favourite sandwiches, tubs of raisins or cereal, bananas, chopped apple, flapjacks or other cereal bars, cubed cheese or ‘strings’, carrot sticks, cooked sausages, crisps and mini rice cakes. Basically anything they can hold and devour in one hand. Drinks are best in small cartons or non-spilling flasks. Don’t forget the baby-wipes. Or, if you’re environmentally-minded, pack a damp flannel in a (recycled) plastic bag. And can I also recommend a designated rubbish bag? I’ve lost count of the number of times I’ve ended up accumulating wrappers and tissues in my handbag or pockets, only to find months later in a disgusting state. 1. If you can overcome your discomfort at allowing your child to immerse themselves in a small screen for an indefinite number of hours, DVDs definitely make long journeys easier. 2. As do iPhone games, Nintendo DSs, Playstation PSPs and any other technical gadgetry that you might otherwise frown upon. Final word of advice? Once you’ve made up this fabulously organised kitbag, make sure it’s within arm’s reach. When you discover that your husband has unwittingly buried it in the boot, it can seem a surprisingly long way to the first service station.